Place cream cheese and powdered sugar in a mixing bowl. Using a hand mixer, blend until smooth. Add in the pumpkin, sour cream, cinnamon and nutmeg. Blend well. 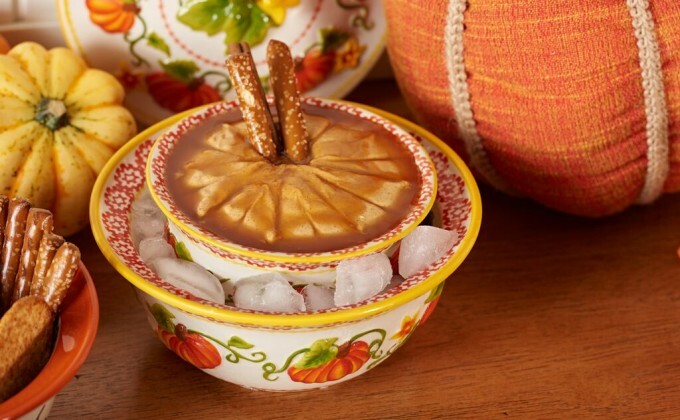 Pour batter into your temp-tations® serving bowl from the 3-piece Lidded Chill & Serve Set. Warm caramel in the microwave for 30 seconds. Drizzle in a circular motion over the dip. To create a spider-web design, place the tip of a butter knife in the center of the bowl and drag to the edge. Continue doing this around the entire top, leaving 1/2 inch spaces between each line. Sprinkle with salt and garnish with pretzel sticks and cinnamon sticks. Serve immediately.